Realistic practice test questions with in-depth explanations and easy to use flashcards to remind you of important concepts. Check out a demo here. All questions include explanations so you’ll know why the correct answers are correct, and why the incorrect answers are incorrect. This way no matter how CompTIA words the questions, you’ll be able to answer them correctly. Multiple quiz formats including more than 300 practice test questions. Questions are organized by each of the four domains. Once you master the content, use the Test Your Readiness Quiz to check your readiness. Domain 4 Hardware & Network Troubleshooting. Test Your Readiness Quiz. Random 90 questions from the full bank of test questions to test your readiness for the live exam. 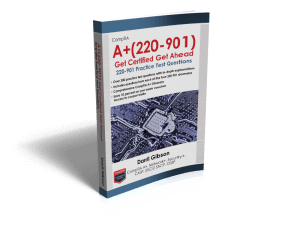 Includes 201 Flashcards to remind you of the important 220-901 concepts. A comprehensive glossary of all the key terms and acronyms you need to know for the A+ exam. The glossary is available online with easy-to-use links for navigation.